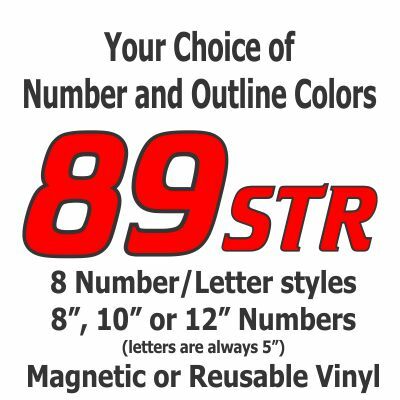 Outline Die Cut Autocross-Track Day-Race Car Magnetic or Reusable Individual Number Package include the numbers (8", 10" or 12") and class letters (5") you need for both sides of the car. These numbers are individually die cut and do not have a background! By purchasing a package, you save close to 10% on the order. 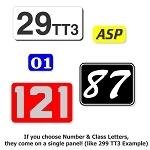 This kit includes 2 digits for the car number and 3 letters for the class designation. 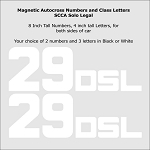 Sorry, we are unable to accommodate multiple additional numbers and letters in this discounted package, if you need more than please order your numbers individually! Very happy with quality and appearance, magnets just are not strong enough for track days, lost two of my numbers only the second day using them. Q: Can you confirm that this package contains 2 set of number and letters (1 for each side of the car)? Q: Do the number packages come with two sides, left and right side of car, or do I have to order two packages? A: Package comes with enough for both sides. 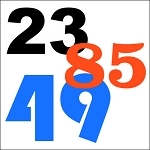 Q: How thick is the outline on these numbers/letters (EuroRacer font)? 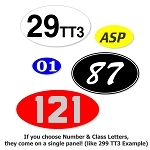 I currently have a white car and was thinking of getting white numbers/letters with a black outline but need to ensure they are legal for autocross. Q: Is there a way to get a set that is slated on one side, and slated left on the other? A: Yes, the Block and Curved fonts are available in slant right and slant left - put a note in the order comments that you would like your package to slant left and right. A: THe package comes with enough for both sides of the car. Enter the Numbers and Class letters needed. 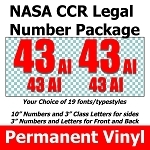 A Number Package includes 2 Numbers and 3 Letters for both the left and right side of your car.